Last month I spent a few days in the Basque country to see how the Osprey reintroduction project was progressing with my colleague there, Aitor Galarza. So far this year they have recorded six translocated ospreys returning from Africa to the estuaries on the Bay of Biscay – all of them males. In April, the male which has been guarding a nest in Urdaibai reserve, exactly where the young Scottish ospreys were released, attracted a female Osprey to stop. All looked good, she was on the nest for some days and blue N1 was excellent at providing fish, but after feeding up she left him and flew on north. A big disappointment but we have seen this happen before in other projects, such as the translocation of Scottish ospreys to Rutland Water in the late 90’s. It’s always a question of patience and suddenly a female will decide to stay and the recolonisation of lost breeding areas begins. The first female to breed at Rutland Water was not one that we translocated, but one that was persuaded to stop off on her journey north by displaying males with nests. Tim Mackrill was one of those who saw these things happen. He started at Rutland Water as a volunteer when he was at school; then went on to do a degree at the University of East Anglia and subsequently join the staff at Rutland Water Nature Reserve. By this time I knew him as “young Tim” as opposed to my great friend Tim Appleton the founder and manager of Rutland Water Nature Reserve – who to me was “old Tim” – I should have said “older Tim”. We got to know Tim better when he came north to research a dissertation on the fishing strategies of ospreys in the Highlands for his university degree. More recently, I was delighted that he researched the mass of satellite tracking data that we had built up on ospreys migrating from UK to West Africa – including the very first use of satellite transmitters in 1999 and our ground-breaking use of GPS and GSM transmitters with Google Earth mapping and immediate display on our websites. This resulted in Tim gaining his Ph.D. at University of Leicester. I was then very excited that he asked to join my foundation to help us carry out exciting projects on birds and mammals. It’s a new beginning for us and I am so happy that the future looks bright as I get older – we have changed our name to the Roy Dennis Wildlife Foundation to reflect our broader reach and it would be great if you would like to help us continue with our bold and proactive projects. Click here to find out how you can help. Over last weekend, I got good news from North Spain. When Brian Etheridge and I were there in May, Aitor showed us some estuaries further to the west where two males were located. We met Carlos, a local birder, at an estuary holding a single male and encouraged him to get his man-made nest up quickly. Within days we learnt that the male took it over, started adding nest material and then attracted a potential mate – an unringed female – his photo to right. Let’s hope she likes the plentiful mullet and this male, and that next spring she will return – it’s too late to breed this year. 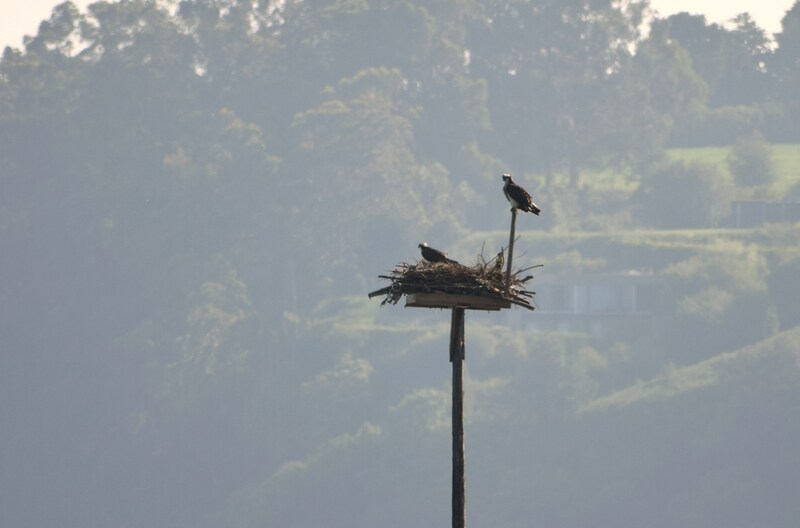 Another step in the project started by Aitor and his colleagues to restore ospreys to North Spain. We are proud to be partners.